When you’re trying to make a lasting impression with printed materials, you want to consult with a local print expert. That’s where we come in. Stop by The UPS Store at 6841 Virginia Parkway to talk with a real person, someone that can help you design and print that perfect flyer, brochure, menu, invitation, banner or sign. We offer a variety of printed materials and are your local resource here in McKinney for all of your printing and copying needs. With shredding services available at The UPS Store located on 6841 Virginia Parkway in McKinney, you can get rid of your personal and business documents using one of the leading document destruction vendors, Iron Mountain®. Shred your items to help protect yourself and your business from identity theft. The UPS Store is your professional packing and shipping resource in McKinney. We offer a range of domestic, international and freight shipping services as well as custom shipping boxes, moving boxes and packing supplies. The UPS Store Certified Packing Experts at 6841 Virginia Parkway are here to help you ship with confidence. Looking for a notary public in 75070? The UPS Store at 6841 Virginia Parkway offers convenient notary services near you. Stop by today to get your documents notarized and check another item off your to-do list. Get easier checkout and flexible billing for your small business. Learn about opening a house account at The UPS Store on 6841 Virginia Parkway. We are a locally owned and operated The UPS Store location, and we care about our customers. Stop by and visit us today. We're confident you'll be glad you did. By understanding our customers' needs and challenges, we help you do more while saving you time and money. We offer a wide range of print services, including color copies, black and white copies, digital printing, offset printing for business cards and brochures, marketing and sales materials, binding, laminating and other finishing services, as well as speciality papers. 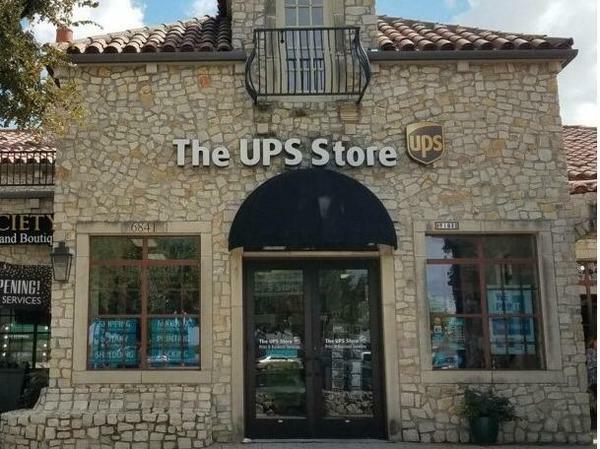 You'll also find most of the postal products and services you need right here at your neighborhood McKinney The UPS Store. We can help advise you on the best service options from one location without standing in posal office lines. As the packaging-and-shipping experts, we offer a wide variety of UPS shipping options, from ground and overnight service to weekend deliveries and freight, across the country or around the globe at low prices direct from UPS. There is nothing too big or small for us to ship! Notary Services Our licensed professional notary services are just another way we make life easier. We also offer faxing services (sending and receiving), Moving Supplies, Office and Mailing Supplies, rubber stamps and engraving, greeting cards, key duplicating, Recycling services, and Name badges and signs, etc. The UPS Store in McKinney, TX is here to help individuals and small businesses by offering a wide range of products and services. We are locally owned and operated and conveniently located at 6841 Virginia Parkway. In addition to McKinney, we also service Frisco, Celina, Anna, Princeton, Prosper, Plano and surrounding communities. The UPS Store in McKinney has a Notary on-site during our normal hours, Monday through Saturday. No appointment is necessary. We are the packaging experts to ensure the safe delivery of your shipped items. Low cost, quick and reliable shipping options with UPS and USPS. You can count on us to package and ship your items domestically or even over seas! We've got you covered. The UPS Store Stonebridge on Virginia in McKinney in McKinney, TX offers the following products and services.